This week a number of different things (Patrick’s funeral being among them) have led me to reflect on what Christ’s redemptive work means for us with mortal bodies. The theological circles I tend to watch most closely rightly point to salvation by grace through faith, not by works, but I am increasingly irritated by the downplay of human experience and work as an intentional part of God’s great plan. Like Carol Danvers at the end of Captain Marvel, God had literally nothing to prove to Satan. He’s God! He could have just consigned Satan to Hell for all eternity from Day One (or, heck, from before Day One). And at numerous times in the Bible (Gideon being one), he could have saved his people without using people. And yet he chose to allow rebellion, and he chose to play out his grace through very flawed humans. He had no need to become fully human—to live and breathe and eat and physically touch people and get tired and cry and suffer and die—yet he chose that as the plan for our salvation. He chose to use Paul, a mortal man, to declare that our bodies are his temple—the place the ancient Israelites were to play out the drama of Christ’s sacrifice through lambs; the place where people found both spiritual and physical cleansing; the place they found fellowship with God and each other. In other words, our mortal works don’t save us, but they are intended as an entry point to God’s grace, both for ourselves and for each other. 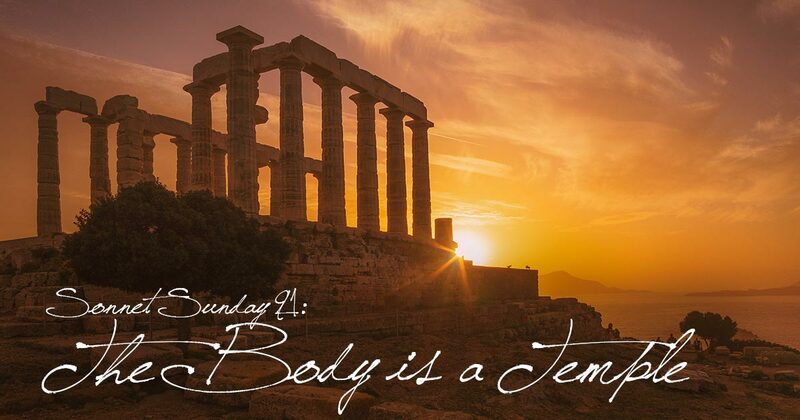 The body is a temple for the Lord. The Spirit shining in each coo and wail. The pillared limbs, the altar of the heart. By age or by another enemy. Our temples toppled, but—great mystery! But God’s will be rebuilt one glorious day.